Checking out a book through overdrive. I use Kobo for a lot of my e-reading. However, sometimes I realize that I am spending all kinds of money on ebooks. Sometimes lots of money, money that could go elsewhere. Plus, I like supporting librarians and libraries (seeing as I spent so much time as a librarian and in a library). 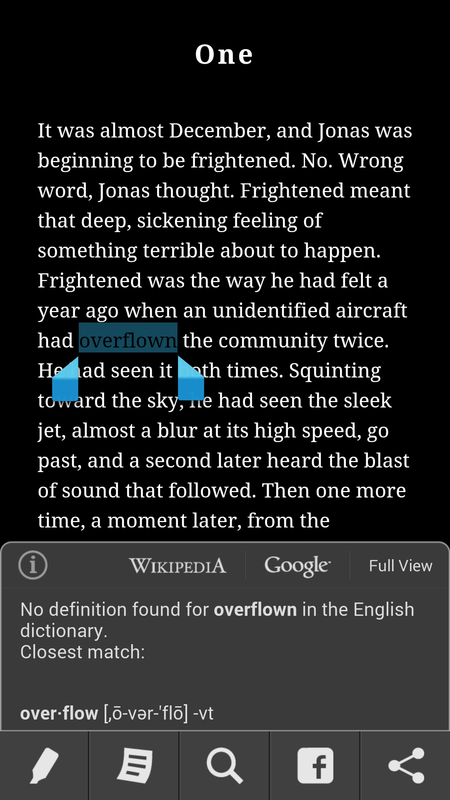 So I use ‘Overdrive’, an app that allows me to check out books from the public library as ebooks. It’s quick, easy and all I need is a library card from my public library. 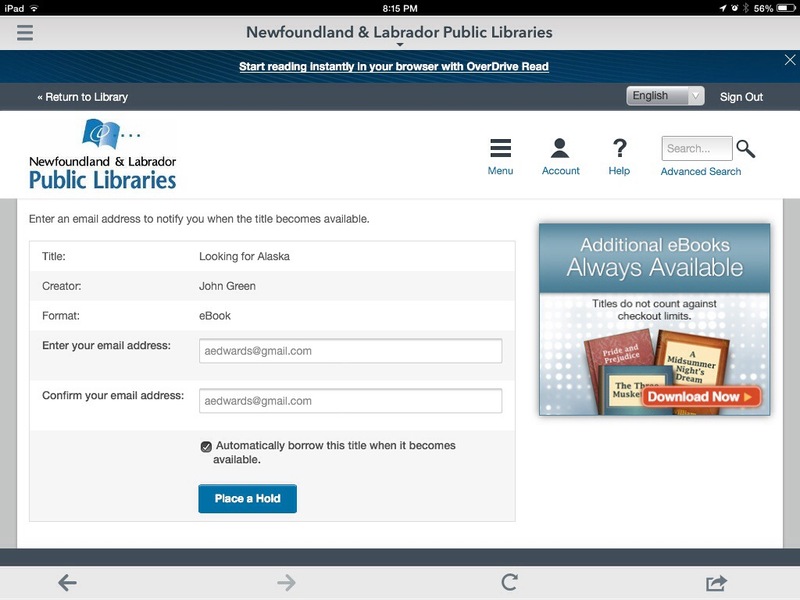 Once you set up the library in the app (you choose the library you want to access, theoretically, if you have access to a number of libraries that use overdrive, you could choose from them all). You can choose your category (fiction, non fiction, teen fiction, etc) and then see what there is to check out. You can choose to see just what’s available now, if you’re looking for something to read now, or you can see all that’s being offered, if you’re looking for something specific. You can also search for a specific title or author. In addition, overdrive will feature their most popular titles on the front page, as well as popular titles in specific categories. more takes me to a description of the book with the opportunity to choose all those items and wishlist adds the book to a list that overdrive keeps of wishes of mine. Once I choose checkout, I’m taken to a page to type in my library card number and my PIN. You need to set those up through your public library. Then, when that info is in, you choose to down load the book to read in your browser and boom! You have a book borrowed from the library for 14 days. Yay! Putting a book on hold. But what if they list the book you want but someone else has it? Those cads! You can put it on hold. Essentially, where it normally says borrow you can choose to put it on hold. You put in your e-mail address and overdrive will e-mail you when the book is ready. You have to check it out fairly quickly or you lose your claim on the file. So, this won’t work if you already have your limit on books checked out. But it does work if you want a book and are willing to wait for it – and return other books if it means having space to check that one out. You can play with the settings and chance your checkout times from 7 to 14 days. You can check out pdfs, ebooks and audio books. You can read the books in the app. If you don’t return the book, it returns automatically. It’s all fantastic. Well, except for one point. Publishers do not always make books available to libraries and overdrive. Their fear is that they’ll lose out on money as you don’t need to replace ebooks. At times, they’ll make it so an ebook can be checked out a limited amount of times, but most others make it so that their books are not available. Not cool publishers. Not cool. So, if there’s a book you really want to eread and the library doesn’t have it (to borrow or to put on hold), you may just have to buy it. However, if it has the books you want, overdrive is a great alternative to spending the money and helps you support your local library while you do it! Win-win-win! The images of overdrive were taken on my ipad. 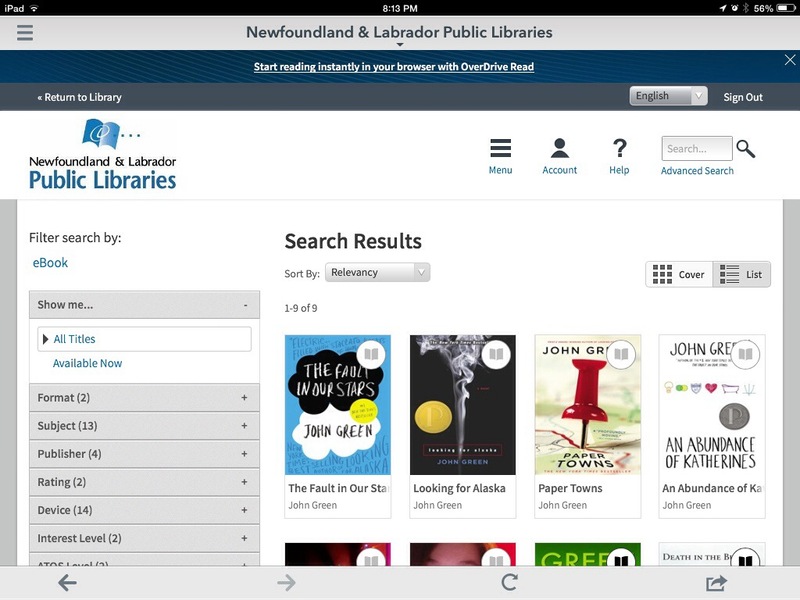 I use the Newfoundland and Labrador Public Library (NLPL) as my library of choice. I am not the most organized person. Well, compared to some, I am super organized and the poster girl for keeping things in order. Or at least that’s what I’m told. However, when writing or creating, I try to make a plan – map things out and get it all in order before I start. This is a skill that took a while to develop and one that I appreciate any and all help to make it easier. There are a few great sites I use and encourage students to use – especially those who say they don’t need to make any outlines for their work. Screen shot of popplet I made with my English 3202 last year. Popplet itself can be found here. use it to present information or to map your ideas. I like using it with students for study, especially since I can colour code each idea (and colourcoding is my life!). Popplet is free to start – you just need to sign up with an e-mail address. However, if you want more than five popplets, it costs 3$ a month or 30$ a year. For me, it was worth it but for students it might not be. They do offer an educational option – popplet groups. This option offers a lower cost for popplet accounts for student groups – a cost between 2.00 and 0.50 per account depending on how many students are signing up. For teachers or schools that want to use this as a good organizational tool, it’s a great price. With popplet you can do some great maps. You can then set up timings and order and present them to others or just keep it for your own usage. If you’re using it for organization for essay writing it’s excellent – simply put the name of your topic in the center in one colour, then follow that by linking your three topics. Then, link your info for each topic. You can find connections and from that build transitions from section to section. Making each section a different colour will help you see your topics that much easier and from that, help you organize. You can also add pictures and video. AND, you can embed it into a website, well, if your site supports flash. Mine apparently does not. You can access your popplet account on the web or with your apple product. Whether you use it for essay organization, for exam review or for presentations, popplet is pretty nifty. 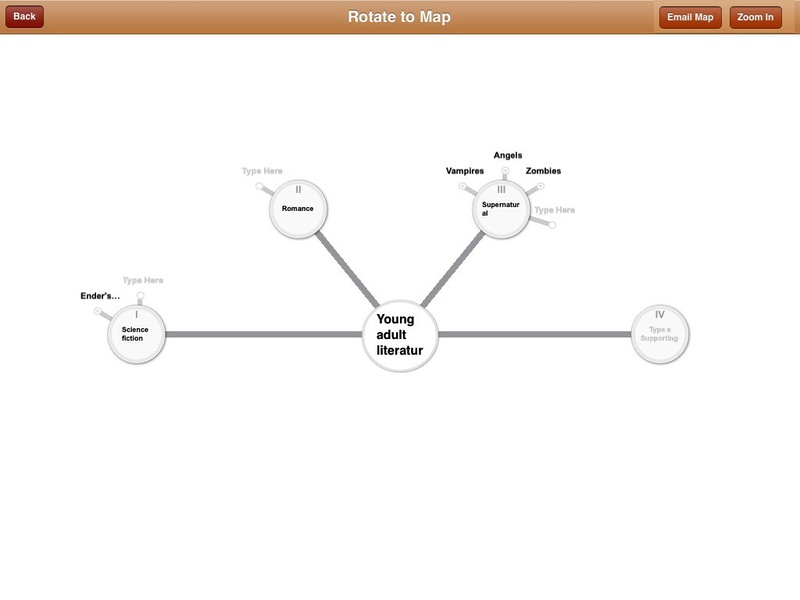 There’s a neat app for apple called MindMap. It’s 1.99 at the app store. it gives you a more textual outline, more like you would write on a piece of paper. You can edit it in either form, which ever works best for you. If you want and have e-mail set up on your iPad, you can send it to someone (like, perhaps your teacher who required an outline for that paper you’re working on?). 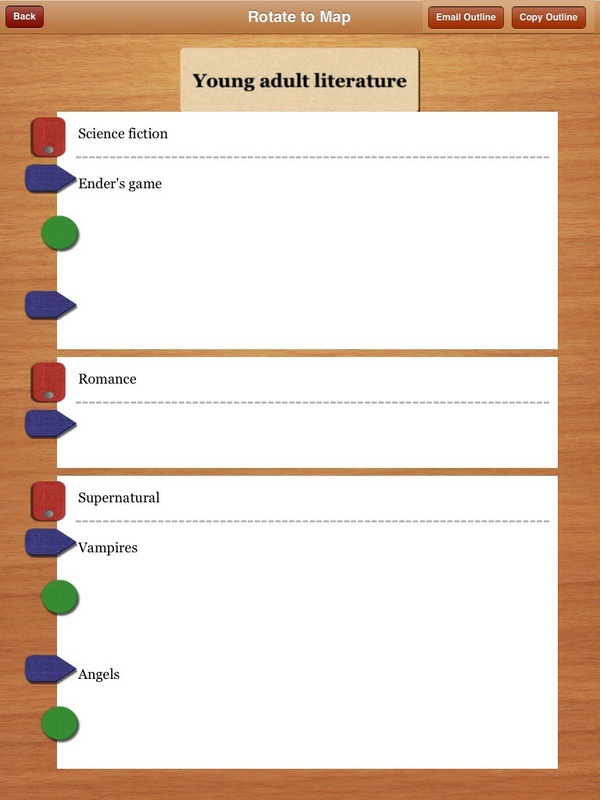 The vertical option does have colours, but the horizontal does not – I like popplet better for mapping because of that, but the mindmapping vertical is great for those who like to make lists, not maps. and details that prove each of those topics. By simply clicking the arrows, you are prompted to move through your details. At the end it allows you to print, save or share. Very useful for writing the traditional five paragraph essay. And free! All you need is a computer – you don’t even need to sign up for anything. A teacher could just print off the pdf of a blank map if they don’t have access to the technology, however, as long as students have access to a computer, there’s no reason they shouldn’t pass it in. One of the biggest questions that students don’t understand when it comes to essays is coherence. One of the biggest comments I give when I pass back essays is ‘focus’. These tools will help all students working on essays achieve coherence and focus as they attempt to write the perfect essay. Ok, so you like to read….. I really like goodreads (Goodreads.com.) It’s a social media website for reading! Yay connecting! Yay social media! Goodreads is a place to connect with other readers. It’s also a great place to find book recommendations and set challenges for yourself. At times, I have goodreads and kobo open in two different tabs – one to find books and one to buy them! To use goodreads, you can just visit it as a website. It will give you access to descriptions of books and reviews. You can sign up and get a fuller experience. I signed up and was able to customize – I have followers and I follow people (equal opportunity stalking? ), I get book recommendations and I can join groups of people discussing books. Plus I set a reading challenge each year – this year I set it for 400 books. I’m up to 329, which amazes my students. When looking up a book, you get to see the book cover, as well as any other editions that have come out. It has the ISBN of the book and the publisher blurb. You can click on the authors name and find a list of all their books – useful if you liked one and want to see what else they have done. There is a ranking – 1-5 stars – as chosen by the users of the site. You are then able to see reviews written by people who are your friends and then reviews written by the general population. Useful when picking a book as it’s not trying to sell you the book (although there is a link to amazon and a corporate connection there). As well, there are quizzes to help you test your knowledge of books and a place to share quotes you loved from an author or one of their works. For those interested in YA literature, there is a page devoted just to that. You can find it at https://www.goodreads.com/genres/young-adult?original_shelf=ya-lit. This page shows new releases tagged as Young Adult, has contests to win young adult books, has lists of books that users have made that contain young adult books, shows the weekly most popular as well as the most popular overall, and then, if you’re a member who has read some YA lit, shows new and upcoming releases by authors you have read. It’s a fantastic way to find books to read. The lists especially. Goodreads is a website and has apps for apple and android. It’s free and you can link it to facebook to connect with others. This post is not groundbreaking – the site has been around for ages. However, if you’re unaware of it, it’s a great place to track what you’re reading. Teachers may find it a good way to share book discussions and reviews (I might even start a group for my students as a virtual book club). For book nerds like me, it’s a great way to find that next great (or good) read. When I decided to eread, I went, without research or review, to Kobo. I chose Kobo as I am a fan of Chapters and they are linked. So, the reader was chosen based on the bricks and mortar store. Go figure. As a Canadian, it’s been nice using a reader that works well in Canada and as a reader it’s been easy to use. 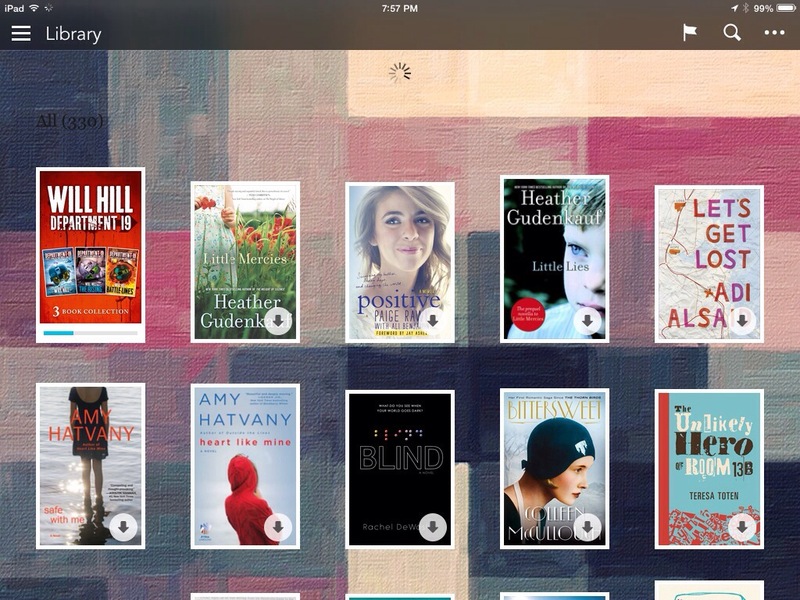 This post is a look at how Kobo works in a few formats, including options I enjoy and wishes I have for each app. My current reading library. Note all the circles with arrows – they are books that need to be downloaded. account my son uses, just in case he runs out of books and doesn’t have anything else while we’re out and about. It has come in handy. There are some differences in the apps, nothing major but enough for me to notice. I’ve taken screen shot from both – the one with all the 39 clues books is from my phone, the one with all of the obviously summer relaxation reading is my ipad. Menu, including store access on android. books from kobo. In the iPad app, you cannot access the store (or, if you can, I can’t figure it out and it’s something I’ve looked for!). You can access the store in the android app by accessing the home menu. If you are using your iPad, you have to purchase from the website. 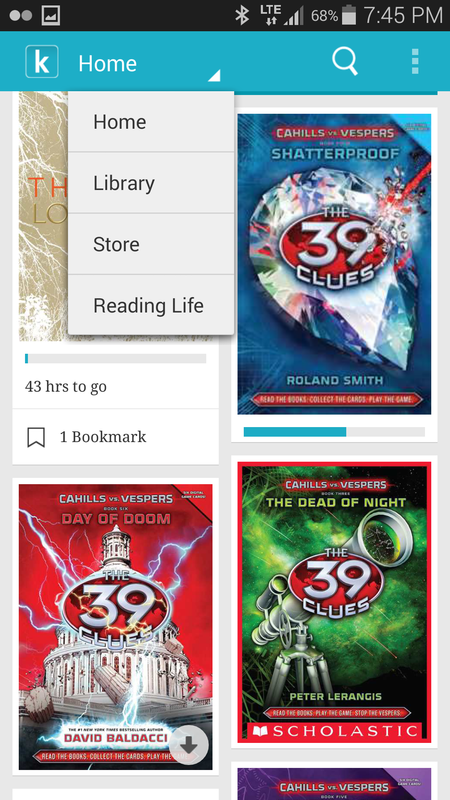 Once book are purchased,the next time you access your app, the covers for the books will appear in your library. They will have a small grey circle in the bottom right corner. You touch that and it begins downloading. You will need access to the internet for this to happen. When you download a book it will take up space on your device so you’ll have to make decisions on what is kept in your library. If you’re reading a book for class, keep it there once you have finished it. If you’re reading for pleasure, you can ‘close and remove’ books once finished. 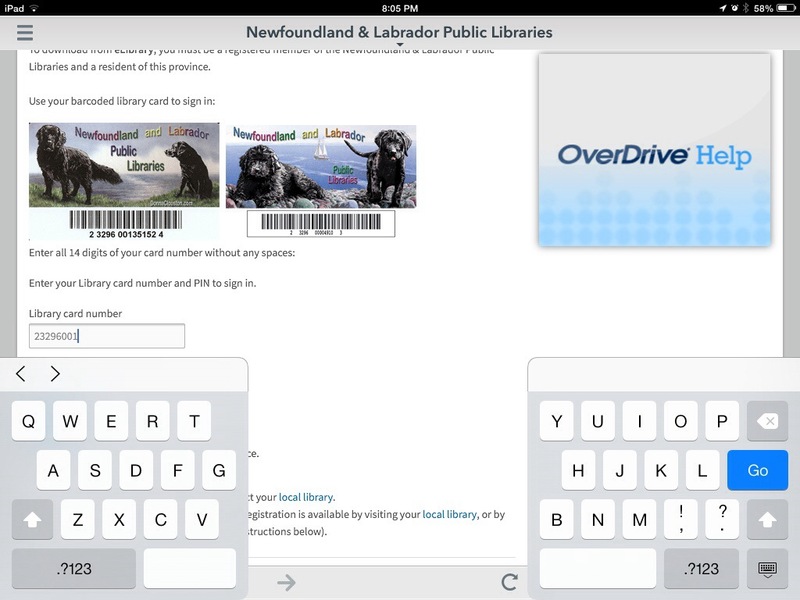 To do this is different on both android and iPad. Android asked you if you want to close the book. You then need to select the cover by holding down on it and choose remove – either from device (which means you can download it again later) or from library (which means you don’t have it anymore). Personally, I take advantage of the removing it from device on either platform. Makes it easier to access books I want to read again without taking up space on my device. You can keep as many books as you want in your library; it’s all about the space on your reading device. I tend to download a large number of books when I travel in case I don’t have wi-fi in my hotel and don’t want to use up roaming data. Otherwise, I tend to just have the book I have reading housed in my library. You can personalize a kobo to look how you want. I personally pick a black background, the smallest font and then bump up the brightness. 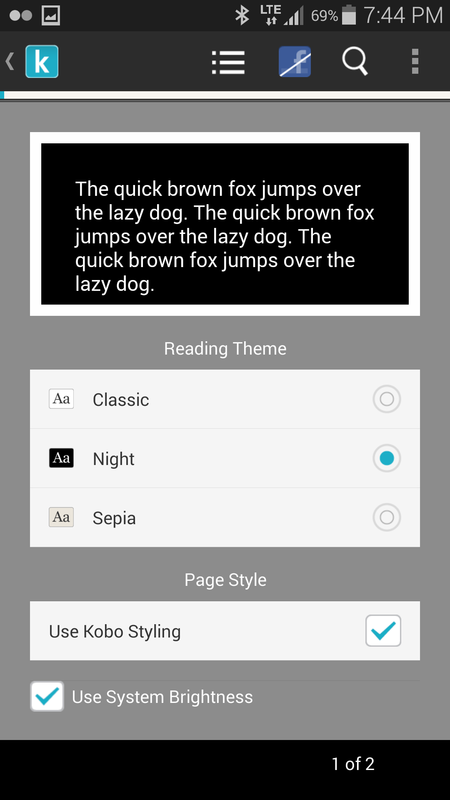 Each option was chosen based on my reading style and my eyes – the black background is the easiest on them. You can choose from a variety of different options in ipad and can choose from three options in android, but really, it’ll come down to personal preference – like your books paper coloured? Sepia or White? Want it darker? Play around and figure out what works best for your eyes. You can also chance options such as how your page turns and how big you want your text. I keep it small but find there are some books that are not set up for a small font – the lines overlap, the words merge. Upping the font helps with this. 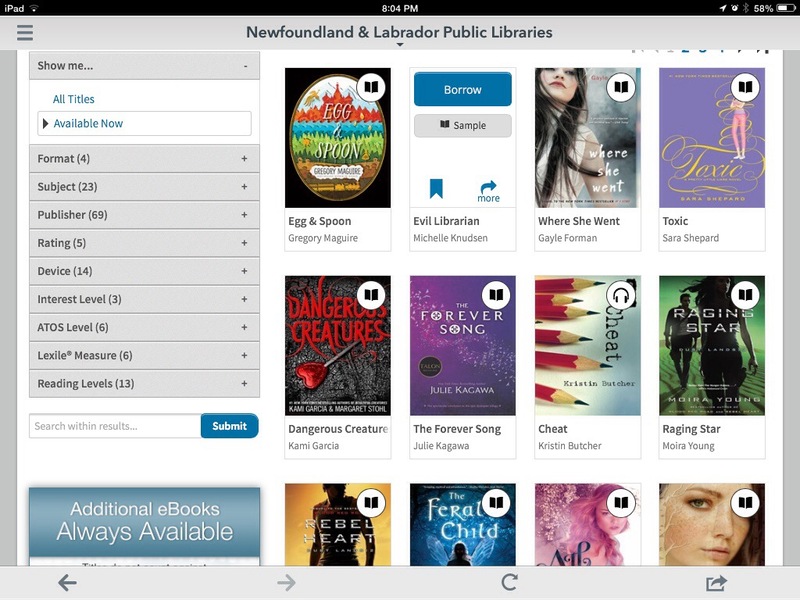 Kobo has lots of options for your personal preferences, both with android and iPad. If you are new to e-reading, you need to determine what you like. In the iPad app, there are options given to highlight and make notes in your book. I’ve used this when teaching – put notes in and then put it on the board, or simply use it while teaching. It has replaced my post it notes from years past. To make notes, you simply highlight the word or phrase you want to make note of and a menu will appear. This gives you the option to add a note or to highlight. You can even choose the colour of your highlighting if you’re picky about that kind of thing. Given that I used to use specific coloured post-its for different factors in a novel (characters, conflict, symbolism, etc), different highlighting colours is perfect. 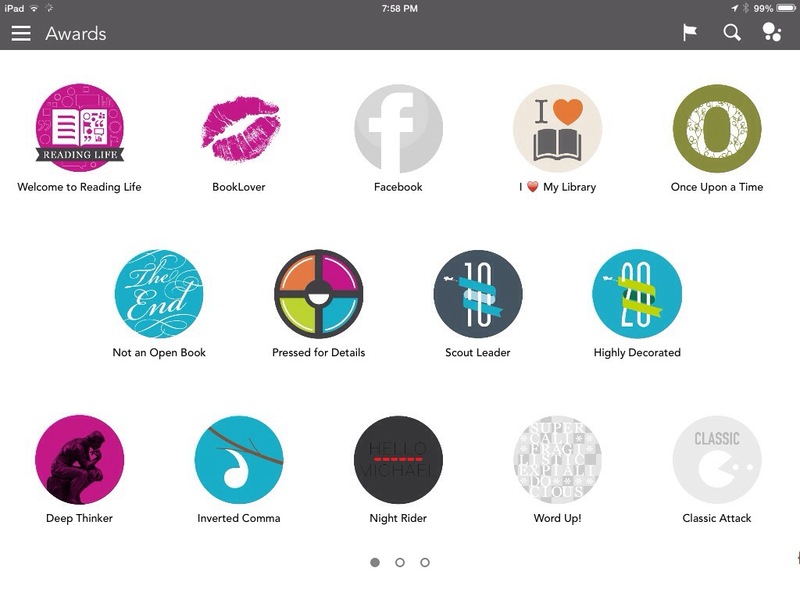 Kobo allows you to keep your notes private or make them public – if public, anyone reading the book can access them. You can also choose to read notes others make public – I stopped doing that when too many squeeing fans exclaimed when their favourite character appeared again, but do find myself turning that option back on when I am reading a classic I am teaching. You can also search for phrases; kobo will search the web and their built in dictionary to help your understanding. This is very useful, especially when books make reference to historical figures and events that are less than familiar to you. I’ve used this several times when reading historical fiction and non fiction. You will need access to the internet for this option, so if you are on a plane or you are out of data, it won’t help. One nice thing about kobo is that it gives you awards based on your reading. They have thirty eight different awards, from ‘Book Lover’ to ‘I eat books for lunch’. I have earned all but five of them. It’s a nice little perk when you start out using the kobo – having notifications pop up stating that you won an award is fantastic. 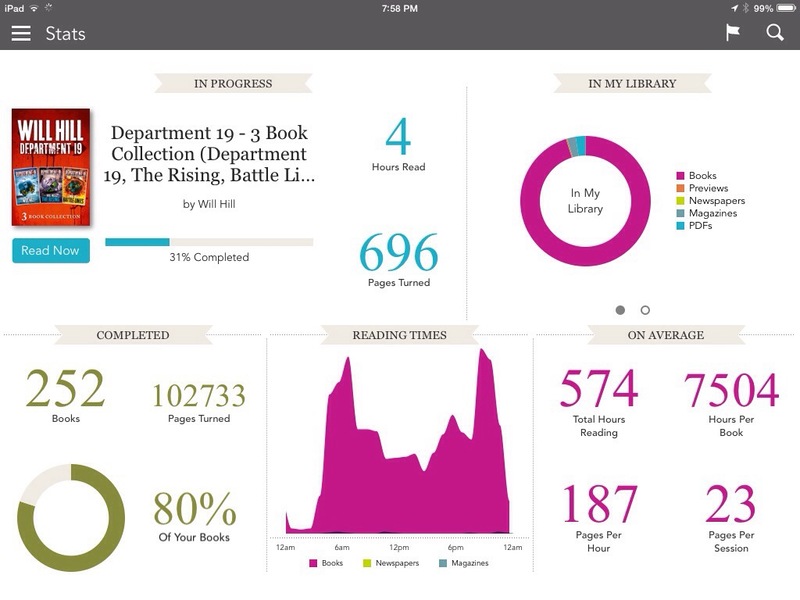 As well, Kobo keeps track of your stats – you can take a look at how much you are reading, the types of media you read, how long it takes you to read a book and other such stats. If you are like me and like to know how much you read (I’m doing a reading challenge) this is fantastic. I especially like to see how many pages I’ve turned – right now it’s over a million and I’ve only been e-reading since the end of November 2013. With the awards and the stats, Kobo has set itself up to give positive reinforcement to their users – if you can measure your reading through awards and positive stats, you might feel good enough about it all to keep using their product. Kobo is my main choice for an e-reader and I use it extensively. One account option that works nicely for me is that I can add a children’s account – my son has an account linked to mine and to which I add money for him to buy books. I get the receipt when he does that so I can keep track of what he’s doing. However, I do not like that I cannot share books with him – if there is a book I’ve read that I’d like him to read he either has to use my device or we have to purchase it again. However, this is something I can hope for in the future. As for now, my e-library is always with me and I am adding to it constantly. I do wish the iPad option had links to the store and the android option had more options for adding notes; between the two they make a great app. Both apps were free and easily available. you also have the option of reading on your computer, if that is your preferred option. There are often coupon codes and promotions that direct me to books I had never previously considered or heard of. All in all, the switch to kobo was a positive one and one from which I have not looked back.